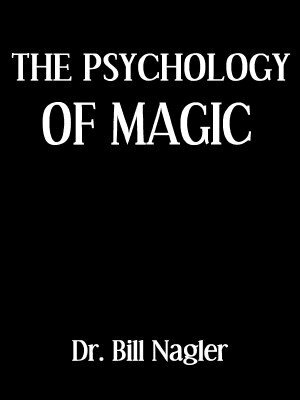 Dr. Bill Nagler is a psychologist and he provides a psychologist's in depth view of the world of magic. The information is radical and instructive.Why do top magicians rarely earn the sums of money that top stars in other entertainment fields earn? Why do some people hate magic so much? What is basically wrong with most people's approach to magic? Find out for yourself and be prepared to be startled and perhaps end up changed in your attitude to magic. Bill includes his full close up act which helped him to pay his way through medical school. You'll see that he is not just a theorist! I think its important to find out that only the first 30 minutes of this audio talks about "the psychology of magic". The second 30 minutes describes the author's close-up restaurant routine. The description of the routine is interesting, as it is well thought out, and there are some interesting variations to standard marketed tricks. This was somewhat different to my expectations. I expected about 50 minutes on theory, with maybe a slightly nod to his current routine at the end, by way of illustrating the theory. On the first 30 minutes, Dr Nagler discusses one very specific aspect the performer-audience relationship. He makes the point that at a fundamental psychological level, people don't like being fooled and this causes resentment and other negative attitudes towards magicians. He then offers four (and a half) strategies that a magician can use to work around this problem. Some of these ideas are found in other books on magical theory, but nevertheless, Dr Nagler does add some interesting ideas to the discussion. Every magician should listen to this tape. Bill Nagler provides an excellent explanation HOW to ensure that audiences do not see you as a simple trickster, but as an entertainer.